What is St. Ignatius doing in a David Foster Wallace movie? At the end of the new film "The End of the Tour," we see writer David Lipsky (Jessie Eisenberg) stealthily inventory into a hand-held tape recorder various objects found around the house of writer David Foster Wallace (Jason Segal). One of those items is the text of St. Ignatius’ prayer for generosity, found taped to the wall of the bathroom. The prayer and its location speak volumes about the paradox that was DFW and his desire for a life of authenticity and meaning—a desire which led him to frequently attend church and twice led him to go through RCIA, without ever being received—while at the same time being fully immersed in, and subject to a culture of artifice and emptiness. 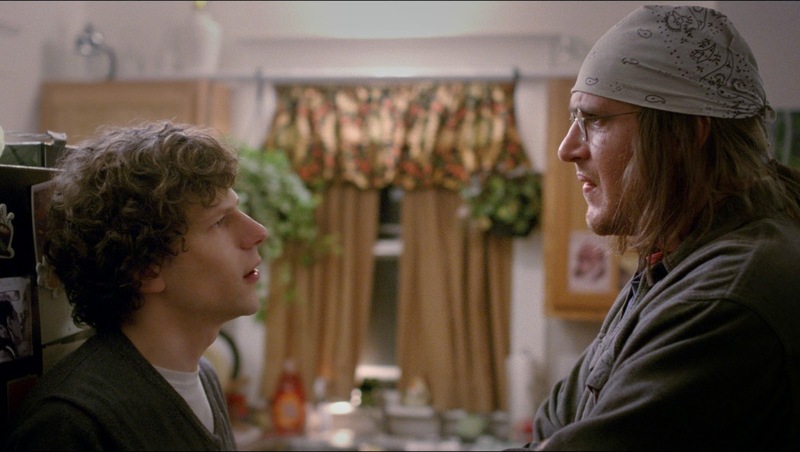 "The End of the Tour" isn’t so much a bio-pic as a hagiography. This isn’t blood and guts history, this isn’t Johnson and Boswell but more like Antony and Athanasius. We don’t discover any sort of complex nuances about the man, DFW, so much as see an innocent, a man-child, too sensitive, too smart, too too for the world. But like the man’s work, the film shouldn’t be taken so much as truth on a factual or historical level, but a truth on another plain, dare I say, on a religious one? Perhaps spiritual might be more palatable. Whatever you’d like to call it, like his work, the film isn’t so much about him, as it is about us. Segal as DFW, is the very best of us: the desire and quest to live with integrity and meaning, to become who we are, as it were. Eisenberg as Lipsky is, if not the very worst of us, at least the most American (at least according to DFW) of us, the part of us that thinks fulfillment is found in achievement, security and things. Lipsky enjoys the second hand adulation he receives by being in the company of genius. The women, the praise, the treatment. DFW is impervious to it all; if there were water to be had, he’d be walking on it. He knows what matters and it is none of the above. Throughout the film we see DFW lurching for connection. Every exchange with Lipsky is fraught with his desperate desire for relationship and Lipsky’s obliviousness to anything outside of the realm of his own self-interest. At one point, having just finished one of a seemingly endless number of convenience store shopping runs, he offers Lipsky part of his candy bar, when Lipksy refuses, he proceeds to break it in half and impose the broken piece onto his companion. Eucharist in a quicky mart parking lot. But at the same time, DFW loved popular culture and all its trappings, he was addicted to television, which he admits to in the film, particularly soap opera with their exaggerated pathos and artifice. He smoked, he clearly loved junk-food. He was a man both in the world and of it, to steal and paraphrase some Ignatius. But DFW was also very concerned with the effect that very same popular artifice was having on contemporary culture. He sounds like a prophet when in the film (set in 1996) he states that the rise of the internet will destroy human relationships and create a world which he would find unlivable. He was almost right on the former and completely right on the latter, sadly. As free as we are as a culture with bandying about titles and proclamations, DFW is/was, in fact, the voice of his generation. Though comparisons between St. Ignatius and a contemporary public figure in a Jesuit publication are trite, humor me—there is something there. DFW, after having had a break-down of sorts, upon the publication of his first novel, came to understand in his mid-twenties (like Ignatius) that the things that have been held up by society as a means to happiness—achievement, fame, wealth—were in fact the big lie, what was on the other side of these ideals was emptiness. Ignatius upon this discovery, founded a religious order, which would become the largest religious order in the world. Wallace wrote Infinite Jest, arguably the finest work of the fiction of the last half-century. Both men were searching for a solution for a problem they didn’t create. Both saw that the solution could not be found in the self, could not be found in the external, could not be found in the temporal. Ignatius ended his days behind the desk of the Jesuit curia in Rome; Wallace ended his by his own hand at the age of 46. Ignatius was canonized in 1622. "The End of the Tour" was released on July 31, 2015, the Feast of St. Ignatius. Jake Martin, S.J., is the author of What’s So Funny About Faith? : A Memoir From the Intersection of Hilarious and Holy (Loyola Press). I want to (must) see this film. Thanks. Cool stuff. Movies always used for entertaining purposes especially among young community. I also make different plans for watching movies online at join 4 movies www.join4movies.info or in cinemas with my friends specially at weekends for some enjoyment. Anyways, you have made very nice review, i have read the little bit of your article, appreciative efforts guys keep it up.